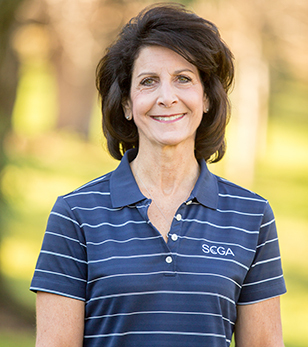 Brenda has been an employee of the SCGA since 1996, beginning at the SCGA Golf Course in finance and then transitioning to responsibilities including marketing, sales and tournaments. In 2010, she made the transition to overseeing the SCGA Member Outings program. Brenda enjoys spending time with her family and dog Jack, cooking, fine wines, gardening, hiking and spending time outdoors. "I enjoy the game and consider it a “gentlemen’s sport." As manager of the Member Outings program, my passion is meeting and building relationships with people, connecting them with others and creating a pleasurable golf experience. It’s a joy to feel the excitement and energy as the players anticipate the courses we visit. Not only is it satisfying to connect new players to the game of golf, but I also enjoy working with the individual golf course facilities." What is your fondest Member Outings memory? "My fondest memory from a Member Outings event was witnessing an 85-year-old gentleman play his former home course of Saticoy. As he grew older his wish was to play there with his adult son. Being a part of making his dream come true is the reason I chose this profession." Contact Brenda Kemball at: bkemball@scga.org.